Bundles are all too late for me. I bought some on my own for my kindle – paycheck by paycheck and then my boss gave me an amazon gift card for my birthday and I used that to buy the rest. Well, I certainly appreciate that–and I hope you’ve enjoyed them all over the past years! Oh yes I have enjoyed the journeys your books take me on. And they were worthy every penny. I met you briefy when you did a signing of “The Exile” at Vrooms in Pasadena, CA. I was with my daughter’s friend, also named Diana. Another secretary @ my work and I are planning to come to AZ for the Poison Pen’s event for MOBY. And I have bought Sam’s books but my son has hoarded them – so I have not had a chance to read them. Some got left in Afghanstan when his tour there ended. – he said they were so good he had to share. I am on my third journey with the series and so wanted to buy the ebook version but UK seems to be excluded from getting them. Tried everything for the bundle but no avail. Keep up the great work, never thought I would like like a historical romance again, since having read every one of the Angelique series to find out the last one was in french and not being translated. Your story makes you want to know what the next generation will be like and understanding the parents you can understand the children. Many thanks. Is this offer open to Canadian ereaders? I don’t know. It’s Random House (US) who’s making the offer–but often Random House (Canada) will join in on such promotions. I’ll ask them. Normally, I can buy Kindle books on Amazon.com from Canada. I use the Kindle app for my iPad. This set shows as ‘not currently available’, however. Love bundles but just like Kathy S. Ive bought them all along the way. Pray for your safety & health all the time, would be tragic if we never got the end of the series. Not that we want anything to happen to you after the series either. Im sure you’ll come up with another great one for us all to follow. Does anyone know whether the books would come as separate entities or as one big bundle? My daughter is interested but has bought a bundled package before where all the books were in one big file and it makes searching for something within an individual book difficult because of the sheer size. No, I’m afraid I don’t know that. Deni, they come in one big file. There will be links to each book in the Table of Contents, but they won’t be separated into individual files. Thanks for the info! I’ll pass it along. I already have my copies (not obsessed or anything but I think the only format I don’t have is paperback because I gave them to a friend), so I won’t be getting the package deal. But, considering that I got them hooked, the least I could do was pass that information on to the folks here at work. I think you just sold another half dozen in my office alone. Why does this offer not extend to your avid UK readers on amazon.co.uk? Pretty please! Well, here’s hoping……. We are downsizing and whilst I love the real thing (hard copy!) books on Kindle take up much less room! I too have bought most of the books on Kindle already but I sent the link to many new readers & got them hooked! *evil laugh* I love getting new people to read about Jamie, Claire, Brianna, Roger, Jem Fergus and all the rest of the fantastic characters. 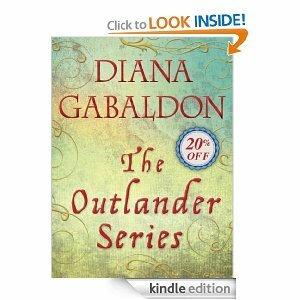 I’m just now reading Outlander and am loving it! It was recommended to me by a friend who is a book blogger (Darlene of Peeking Between the Pages.) As I read, I visualize Gerry Butler as Jamie. He is perfect for the character. I’m looking forward to continuing the series! Thank you for sharing your wonderful story! P.S. I’m hoping someday my writing will be as good as yours. This offer is making it very tempting to buy a Kindle or a Nook! I’ve so far avoided ereaders but am certain that if I ultimately get one the very first books on it will be yours. I have loved reading your books about Jamie & Claire. They become a part of your life very easily. I can hardly wait until the next book comes out. I hope it’s not the last book but when it does come to an end I hope we will find the whole family, Jamie, Claire, Ian, Roger, Bree & their children & Fergus & his family, all together on the Ridge alive! What on earth are you looking at? I’m looking at Amazon.com, and I see Allllllll the books, including the 7-book bundle, every single one with a price. And since it is Amazon.com, I’d be wildly surprised if they wouldn’t sell them to US customers. Do you know if the bundle is still available through the amazon US store? I am trying to buy this for myMom for her birthday. Maybe if I know the country I can switch to that one to get the bundle. I love the Outlander series. I have listened to the first three books twice and have just begun The Drums of Autum. I am curious though, what happened to Furgus’ wife (Jamie’s step-daughter)? Did he leave her in Kingston? I treated myself with the 7-Book E-book Bundle last weekend. I read and reread the Dutch translation several times, but wanted the original version too. Maybe just to appreciate the language even more. I’m looking forward to part 8 WRITTEN IN MY OWN HEART’S BLOOD!